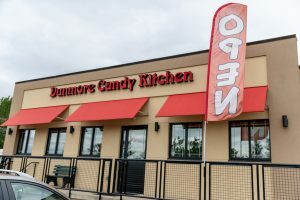 The Dunmore Candy Kitchen has been a stalwart of the Dunmore Community since 1904. After the original owners passed away in the 1960s, employees of the store were offered two options: Take some money or take the name of the store. Mr. Louis Perella, a long time employee of the candy store, took the name and thus, started a family’s love affair with chocolate. Tirelessly working 12 hour days during the holidays, the Perella’s built the candy kitchen into THE place to go for homemade Chocolate treats in Northeast PA. Eventually, Louis would hand the business over to his son Charlie, who would continue the tradition of candy making up until the summer of 2009, when he sold the candy kitchen to Mrs. Laura Reuther, a wife and mother of three from Moscow PA.